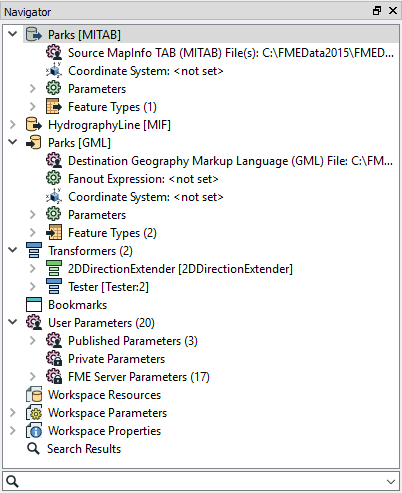 The Navigator displays an overview of the source (reader) and destination (writer) information, bookmarks, workspace parameters, and transformers. In general, it is a hierarchical view of the information in the graphical pane. You can adjust most dataset, feature type, and attribute parameters from here, as well as directly on the canvas. access functions for all entries in the Navigator by clicking on the parameter, and then right-clicking to display a command menu. By default, a Workspace Search link will also display in the Navigator.